***March 11 EDIT*** Jason Brune overcame his first hurdle in the appointment process in late January. Despite 34 of 37 Alaskan testifiers opposed his taking the helm of DEC due to his bias on the Pebble mine, the Senate Resources Committee approved his appointment. On Friday March 15th, 2019 Mr. Brune will make an appearance at the House Resource Committee for a second confirmation hearing. The Save Bristol Bay campaign encourages Alaskans to contact members of House Resource Committee, and their House Representative, and tell them to say NO TO Mr. BRUNE AS HEAD OF DEC.
We also ask Alaskans to testify again in opposition and help send a definitive message that we will not let Pebble’s biggest fan approve its water and air quality permits. Get all the info for the hearing here. Monday, Alaska’s Governor-elect Dunleavy appointed some of his new state commissioners. One of particular concern is Jason Brune, appointed Commissioner of Environmental Conservation. Brune, if confirmed by the legislature will be the person in charge of not only deciding whether Pebble will receive numerous key permits but also about how to enforce, many of the most important permits required to build the proposed Pebble mine, as well as ensuring Pebble complies with the State of Alaska’s air quality, water quality, environmental health, and spill prevention and response programs. Unfortunately, Brune is nowhere near impartial. He was the head of public affairs and governmental relations for Anglo American during their former partnership with Northern Dynasty Minerals to develop the Pebble Mine prospect, and has also been the executive director for the Resource Development Council, a major in-state advocate for Pebble’s advancement. Brune has Tweeted or re-tweeted in support of Pebble more than 100 times since July 2014. 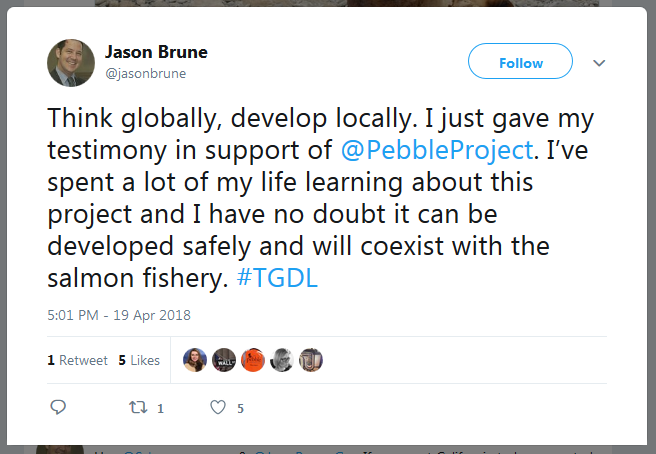 He talks about Pebble much more than any other single project. He is frequently re-tweeted and liked by Pebble Partnership’s twitter account and has social conversations on Twitter with Pebble’s Director of PR, Mike Heatwole. He also has testified in support of the project at public meetings and in the news. Everyone seems to support a fair process. However, putting Brune in a place of leadership with respect to Pebble’s permits is letting the fox guard the hen house. Brune’s past involvement with this proposal and public statements tells us he’s already made up his mind despite the facts, science, and the will of Alaskans.